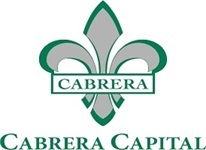 Cabrera Capital Markets, LLC -- founded in 2001 -- provides investment banking and full-service institutional brokerage services worldwide to a substantial and diversified client base that includes financial institutions, unions, governments, corporations, hedge funds, and foundations and endowments. At the core of the Cabrera businesses is our commitment to our clients. We have a highly qualified team of experienced professionals who are well versed in using the firm's resources to manage significant transactions through our growing franchise. The areas of our business are: public finance; municipal bond sales and trading; debt and equity capital markets; domestic equity sales, trading and execution; international equity sales, trading and execution; preferred stock sales and trading; taxable fixed income sales and trading; directed brokerage; and global investment banking.